Feeding your Guinea Pig by hand is important if it doesn't eat anymore due to some disease. We tell you how and what to feed by hand. [Auto translated] Feeding your Guinea Pig by hand is important if it doesn’t eat anymore as a result of sickness (mostly malocclusion). Sometimes it could be very difficult to feed a cavy by hand and in other cases it will eat by hand feeding without any problems. We tell you how and what to feed by hand. The digestive system of Guinea Pigs does not really have peristalsis so the food has to be stuffed continuous to keep its system active. If a cavy becomes sick and refuse food it is important to solve the problem by stopping the disease quickly and spend time for force feeding by hand. Otherwise it will rapidly looses weight and die soon because its digestive system completely shuts down. There is no time for any delay and you should take your Guinea Pig to a veterinarian immediately if it ignores fresh food like salad or cucumber. Do not wait until it’s too late. This serious problem will not sort out itself! If your Guinea Pig does not eat anymore by its own you have to feed it by hand. For cases of emergency it is a good idea to hold always some kinds of syringes and pipettes in different sizes ready. In that way you can directly start feeding by hand if necessary. Depends on your mush you have to choose the right tool to feed your Guinea Pigs safely. If your mush is quite viscous it could help to cut the front of the syringe. Please be careful and ensure that there are no sharp corners in front of the syringe which may hurt your cavy and of course NEVER use any needle! To make your mush more fluid you can mix instant flakes of oat in. Your mush becomes more smoothie. What food for force feeding? Our favored food for force feeding Guinea Pigs is a product called “Herbi Care” but it is quite difficult to get it somewhere else than in Central Europe / Germany. But Critical Care is almost as good as Herbi care and it’s available worldwide. If you have got no Critical Care or any equivalent powder, you can start feeding your Guinea Pig by hand with pellets you soaked in simmering water to get mush. You can also powdering the pellets in a coffee-grinder and mix it with lukewarm water to a mush too. Let it cool down before you start force feeding. Usually the cavies really like the food you provided by hand because of its ingredients and it might not be a problem to feed them if their digestive systems is still working and they are not completely lethargic. 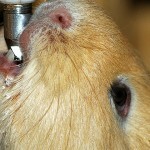 Soak the cooled down mush into a prepared syringe and provide it by holding it to the cavies mouth. Let your Guinea Pig sit on your lap on a towel and may be fix it with your other hand if it is too nervous. Most cavies really yaw at your mush. Only press a small amount out and feed carefully step by step. Give your cavy the chance to taste, chew and swallow. The whole process of hand feeding might take up to 10 minutes. This is really OK! You can also test to provide the mush on a spoon. This might work too, especially if they want to – but can’t eat due to problems with their teeth. If your sick cavy liked the food the next turn might be quite easier. Once you finished force feeding don’t bring your cavy directly back to its cage! Hold it on your lap for some minutes and massage its abdomen carefully and sensitive. This forces the digestive system to work. 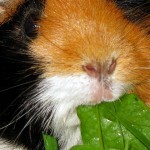 If your cavy does not eat anything by its own you have to start the procedure every 3 hours – also at night. And provide as much mush as they want. In some cases your cavy might refuse force feeding completely. This is a serious problem! Put your cavy onto your lap with its bottom to your body and lift its front by holding it with one hand at its front legs. Now put the syringe into its mouth and inject some mush. Wait until it has swallowed the food and restart the procedure. Don’t feed too much. If they are not hungry they will not eat. Take a look at its weight and how does it change if you feed it by hand. If it still looses weight keep trying force feeding and feed some more. 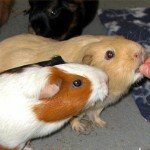 If the initial problem has been removed by a vet the Guinea Pig will restart eating by its own quickly. Do never put your cavy on its back to feed it! It will choke on the food and will be very nervous. The anatomy of Guinea Pigs is not suitable to lay on its back! You can simply create mush for force feeding yourself. All you need is a hand mixer and some ingredients to mix together. You can make some bigger portions and keep it fresh in your fridge for one day. Before you feed it ensure it is not cold so take it out of the fridge duly. Never freeze mush for force feeding because freezing will destroy the cell structure of fiber in the food. 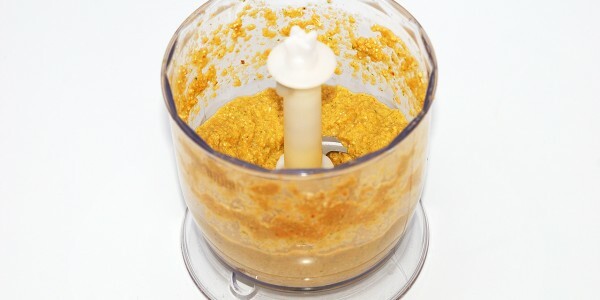 We make this always in larger amounts so we can use it for up to 2-3 days. Soaked pellets with dried herbs are stored in plastic cans in the fridge. Vegetables are regularly stored in the fridge too and quinoa can be prepared for long distance. Once we need mush we’ll put all together and swirl it fresh for each force feeding meal. Oak is grain and should not be provided regularly to Guinea Pigs but it could be helpful if your cavy looses weight. By nature oak does not contain much gluten and should not incommode the cavies digestive system. But it has much of minerals to foster your cavy. Quinoa is often called a fake-grain because it is not really a grain but similar in its nutrients. Quinoa is completely free on gluten and rich in minerals and always a better choice than oak. Use quinoa if it is available. 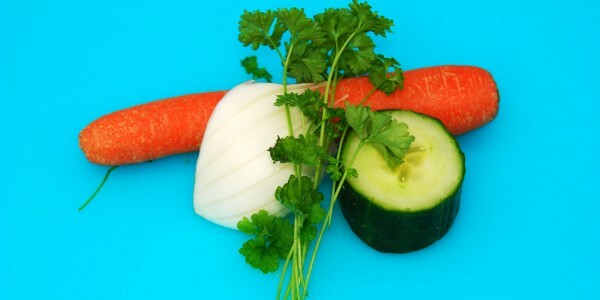 Vegetables and herbs deliver a lot of important vitamins to your cavies and make the mush taste good for them. 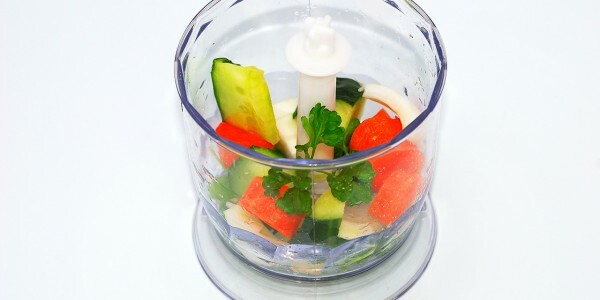 Make the mash for force feeding, breakup all the vegetables you’ve got (see food-list for details of vegetables), put it into your hand-mixer and swirl it with water or fennel tea to a smoothie mash. Then mix the mash with powdered quinoa or oak. Feed it! If your cavies are accustomed to pellets try powdering it and mix it into your mash too. Sick cavies needs a high amount of vitamin C. You do your best if you put a half of teaspoon of ascorbic acid into it too. Glucose can be added to make the mash more rich in calories. Some bought mash for force feeding has been undigested rejected by cavies. This has never been happened by self-made mash here. Anyway, there are some useful products of instant mash available. Our favorite is Herbi Care. This is widely available in Central Europe. Most of the instant powder for force feeding mash isn’t available worldwide so we cut here and reference at least to Critical Care. Test the products that are available in your country yourself or keep up a backup of self-made mash. May be you’ll provide your experience with your favorite in the comments? A true sign is when your pig won’t eat fresh fodder like salat or cucumber. Also if your pig is lethargic or uninterested you might check whether it is sick or not. Can you tell if they asperate?